What many used to simply view as "just a make-up brush" is now being more closely scrutinized for what it actually is... animal fur. 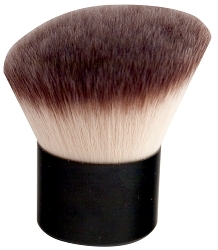 Natural makeup brushes are an extension of the fur industry, and include the hair of squirrels, goats, horses, minks, sables, badgers, mongooses or a combination of multiple animals. As with most other animal hair products, the way they are procured is a hot topic of controversy. As a result of this growing consciousness, an increasing number of cosmetics companies are offering an exceptional array of top-notch synthetic make-up brushes that deliver a a flawless application and a cruelty-free conscience. I personally have made the migration over to synthetic cosmetic brushes and am truly pleased with their performance and longevity. One my favorite features of synthetic brushes... I never have those nasty little stray hairs all over my face! The fibers are ultra soft, they don't break off, and are easy to clean. I love this Angled Kabuki Brush which is great for use with mineral cosmetics and the supple feel rivals even the softest natural bristle brush. Synthetic brushes are also great for applying pressed and loose mineral powders, and loose mineral shadows which can sometimes be tricky for clients to apply. I highly recommend synthetic hair for ultimate purity and peace of mind.